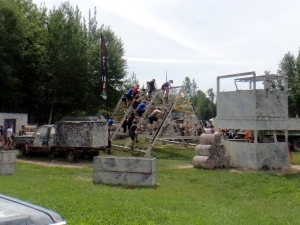 For the past three years, we have been attending the Mud Hero Ottawa events and this year was no exception for providing a fun event for the whole family. This was the third year for this event at this location, and it is well suited to its varied terrain and interesting structures sprinkled throughout the course. Located just south-east of Ottawa, it was easily accessible and supported the Ottawa Regional Cancer Foundation. The cost for this event was $10.00 and this year they had more volunteers and much better direction, so it was quick and painless to enter and exit even with the large numbers of participants coming and going. Online registration was just as easy to follow this year and the emails leading up to the event were frequent and clear to understand. Upon arrival to the event, racers were directed towards the main venue area which was set up as a tent village with ample signage to direct participants to the various areas including a merchandise tent, washrooms, change rooms, vendor area and registration/waiver booths. The line-up for race kit pick-up was about 30 minutes and was organized by first come, first served versus last names to help speed up the process. Bag check was free and well organized. The team headed off to race for 11:00 and were corralled towards the main starting line a few minutes ahead to get pumped up by the enthusiastic MC. Each heat (every 30 minutes) had up to 400 participants with over 9000 racers coming out over the two-day event with more than 3000+ being female. The 6K course was tackled today. 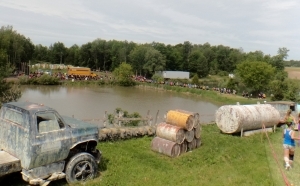 As this is now an annual event, it was nice to know that there were a few new obstacles and the brutal mud pit from last year had been removed completely. There was also the addition of the 10K Ultra this year, and many fellow racers tackled this event with great interest. We had originally signed up for this distance on Friday afternoon, but the event was then moved to the Saturday so some of our plans had to be altered accordingly. The Race Directors were very good and offered either a refund or you could move to a different heat the following few days. Responses to emails were quick and efficient! 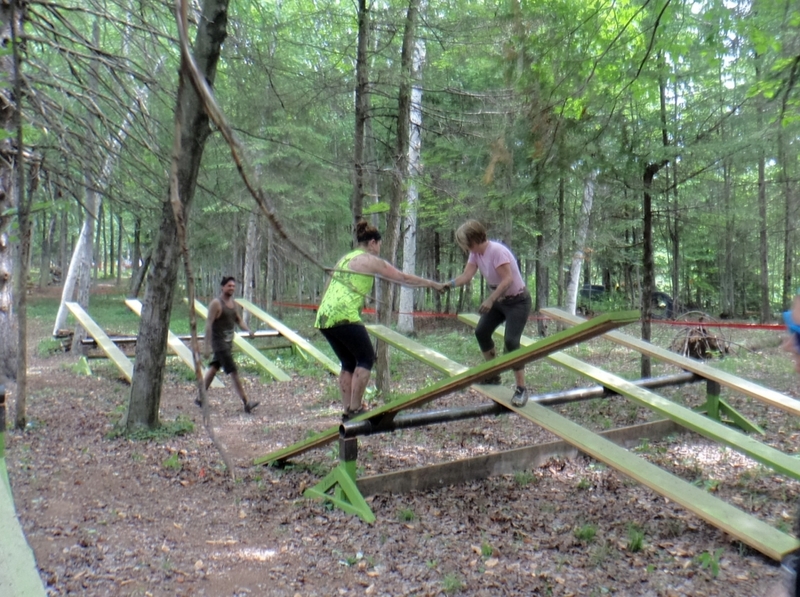 Water stations were well positioned, and the obstacles were spaced out evenly to avoid too many open running sections for those of us who are truly there to climb, crawl, swing and slide. 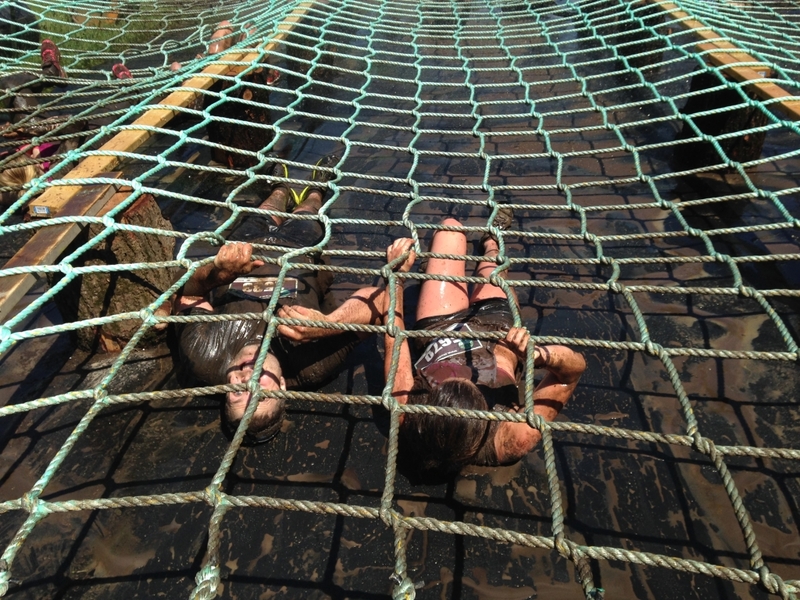 Some of the well-built and usual obstacles were the Kong cargo net & wall climb, reverse walls, tunnel crawls, mud slide, and teeter-totters –each with a creative name (i.e. Backwards Bullfrog) and various levels to accommodate racers abilities. The final slide is still a great ending to a great event. It was nice to see that what the medal for this year would be (always a surprise) and it included a bright pop of colour. Timing was chip timed by Sportsstats.ca and available online shortly after the event. The hose (shower) station was much slower this year and took almost 30+ minutes to get to, some people were over showering with soap, etc…not realizing that this area is for a quick rinse off before you change and then head home for a ‘real’ shower. The vendor and entertainment area was well laid out and could be easily accessed with little to no lines for the beverages. Prices were reasonable, and picnic tables were located under tents to provide shade to racers. We would love to see the ladies cut t-shirts come with V-necks instead of boat necks; they are much more flattering to wear. Overall this race had great communications via social media. The website is well laid out and was easy to navigate. 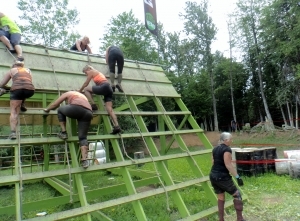 This year the event was also on the list for OCRWC qualifying! The showers were the only area of concern and perhaps it would help to add extension hoses to them to have three people per spigot; this may help with the delays or ask people to bring jugs of water to rinse off with to reduce wait times. Perhaps have volunteers there to help control timings for showers? Or mention something in the race kit on proper shower ‘etiquette’? The headbands are a great addition and went over well, keep on using them, great for photos and no worries about not being able to find your photos based on numbers from a mucky bib or one that gets lost en route. This is still one of our favourite events (fourth year in a row), and we plan to register again for next year and make it a tradition. It was nice to have a venue a bit closer to home (2-hour drive) and not have the added cost of hotels and meals. Thank you to the volunteers and organizers for putting on a truly mudlicious event again this year. 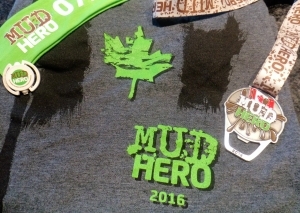 Use discount code MRG16 for $5 off your Mud Hero registration!